This is a bright, nutritious and delicious, perfect soup for the change of seasons. 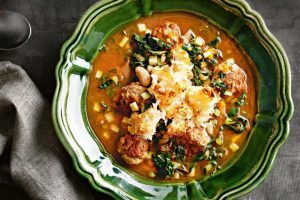 If meat doesn’t play a part in your meal time, don’t discount this recipe, as it’s full of beautiful beans, veggies and flavour. Fennel and tomato are particularly lovely together. You can ditch the meatballs all together and switch the stock for veggie! Easy peasy lemon squeezy. Roll sausage meat into 20 meatballs. Heat 1 tbs oil in a saucepan over medium-high heat and cook meatballs, turning, for 3-4 minutes until browned, then set aside. Reduce heat to medium, add 1 tbs oil, carrot, celery, onion, rosemary and bay leaf and cook, stirring occasionally, for 8 minutes or until softened and slightly golden. Add chilli and fennel, and cook for 1 minute or until fragrant. Add tomatoes and stock with 1 cup (250ml) water. Return meatballs to pan, then partially cover with a lid and simmer for 30 minutes or until slightly reduced, adding cavolo nero, zucchini and beans in the final 10 minutes. Meanwhile, preheat grill to medium. Drizzle remaining 1 tbs oil over bread and grill, turning, for 5 minutes or until slightly golden. Sprinkle with parmesan and grill for a further 4 minutes or until melted and golden. Remove and cool slightly. Stir lemon juice through the soup, ladle into bowls and serve with croutons.